2018 Great Places in California Nomination Period is Now Open! The California Chapter of the American Planning Association is pleased to announce the 4th annual Great Places in California Awards. The nomination period will open Monday, February 5, 2018 and close on Friday, March 16, 2018. Applications may be submitted online. A “Great Place” in California is one that exemplifies character, design, usability, and has a sense of place. This can range from coastal communities to the mountains and can be within a large urbanized area or a rural setting. Three locations will be recognized with a Great Places in California award. 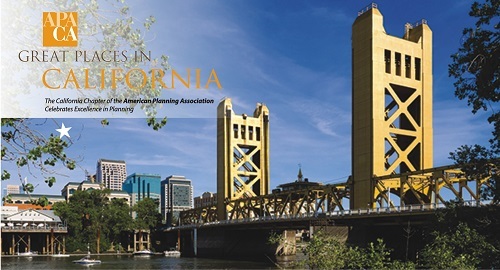 For more information regarding the nomination criteria and to submit an application online, please visit the Great Places in California section of the American Planning Association – California Chapter website. Nominations that did not previously get recognized with an award, are eligible to apply again. For questions related to the Great Places in California awards program, please contact the program coordinator, John Hildebrand – jhildebr@rivco.org (951) 955-1888.